EMLX files are sometimes called Apple Mail Email files because they're typically created with Apple's Mail program for macOS. These are plain text files that store just a single email message. EML files (without the "X" at the end) are often called E-Mail Message files and are generally used by Microsoft Outlook and other email clients. The entire message (attachments, text, etc.) is saved. EMLXPART files are used by Apple Mail as well, but as attachment files instead of as the actual email files. Your EMLX file was almost certainly created by and can be opened with, Apple Mail. This is the email program included with the macOS operating system. Apple Mail isn't the only program that can open EMLX files. Since these files just contain text, you could use a text editor like Notepad++ or Windows Notepad to open the file too. However, it's much easier to read the message if you open it with Apple Mail. As for an EML file, you should be able to double-click it to make it open with MS Outlook, Outlook Express, or Windows Live Mail since all three can open the format. eM Client and Mozilla Thunderbird are some popular free email clients that can open EML files. IncrediMail, GroupWise, and Message Viewer Lite are a few alternatives. You can also use a text editor to open EML files but only to see the plaintext information. For example, if the file contains some image or video attachments, you, of course, can't view those with a text editor, but you can see the to/from email addresses, subject, and body content. Don't confuse an EMLX or EML file with an EMI file (one that has an uppercase "i" instead of an "L"). EMI files are completely different than these files that hold email messages. LXFML files also look kind of similar to EMLX/EML files but they are LEGO Digital Designer XML files. XML, XLM (Excel Macro), and ELM are a few more examples of files that share similar file extension letters but don't open with the same programs. If you happen to have an EMLX or EML file that isn't an email message file and has no association with email clients, We recommend opening the file with Notepad++. If you can tell that it's not an email message when you open it with a text editor, there might still be some sort of text within the file that can be used to help identify what format the file is in or what program was used to create that specific EMLX file. On a Mac, you should be able to open the EMLX file in Mail and choose to print the message, but select PDF instead of to print the message on paper. That will essentially convert the EMLX to PDF. Although we haven't tried it, this program might be what you need to convert an EMLX file to EML. If you need to convert the file to mbox, you should be able to use the EMLX to mbox Converter tool. Tools like EML to PST and Outlook Import should be able to convert an EMLX or EML file to PST if you want to convert the message into a format recognized by Microsoft Outlook and similar mail programs. To convert an EML file to PDF, PST, HTML, JPG, MS Word's DOC, and other formats, use Zamzar. It's an online EML converter, which means all you have to do is upload the file to that website and choose which format to convert it to, and then download the converted file. You can also convert EML to MSG (an Outlook Mail Message file) if you use Outlook. From the File > Save As menu, select MSG as the Save as type option. Another option (that's free) is to use the online EML to MSG converter from CoolUtils.com. If you want to use an EMLX or EML file with Gmail or some other email service, you can't "convert" it to Gmail. Your best option is to set up an email account in the client program, open the EMLX/EML file in the client, and then forward the message to yourself. 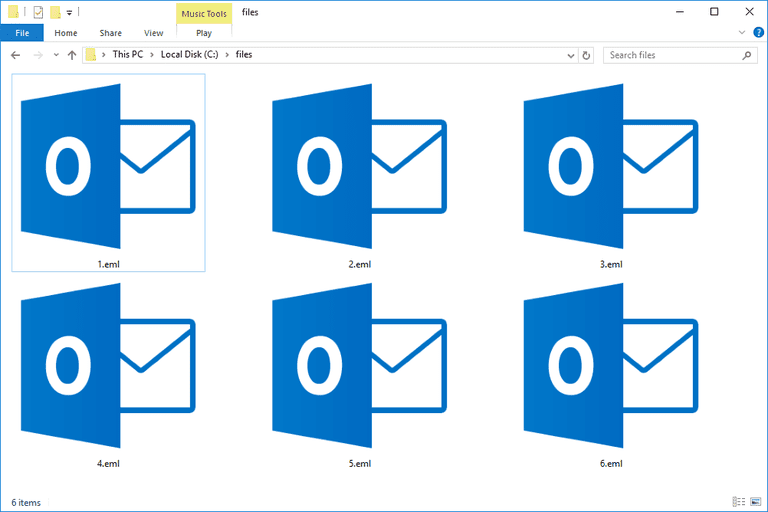 It's not as clear-cut as these other methods but that's the only way to get the message file to blend in with your other emails. EMLX files are normally found on a Mac in the ~user/Library/Mail/ folder, typically under the /Mailboxes/[mailbox]/Messages/ subfolder or sometimes within the subfolder /[account]/INBOX.mbox/Messages/. EML files can be created from a number of email clients. eM Client is one example of a program that lets you right-click and save messages to the EML format.